At the Hood River, OR railroad station, 9:40 AM. May 13, 1942. 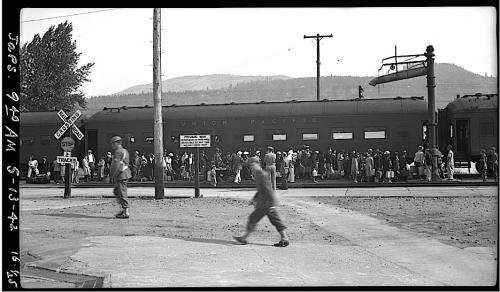 All with Japanese ancestry board for travel to internment camps. On November 16, 2015, President Barack Obama announced that Minoru Yasui would receive a posthumous Presidential Medal of Freedom. The Medal was presented to Lori Yasui in a White House ceremony November 24, 2015. See also my comment #8 under ‘Hillary’s web of Promises. A touch of harsh reality seems necessary sometimes in these prolonged intellectualized discussions of issues. Whatever happened to business school? 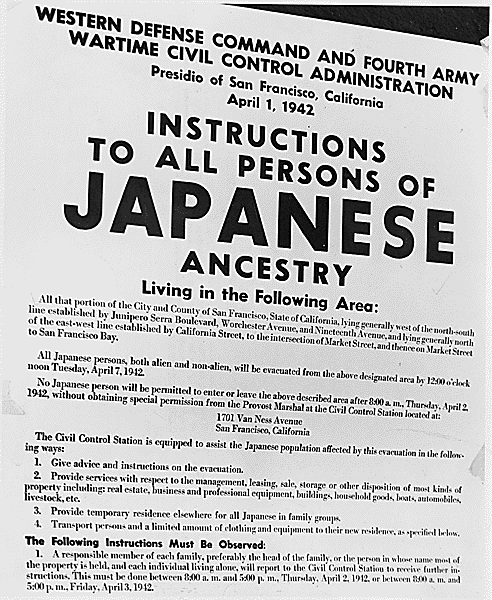 It also happened to Italian-Americans in California under the same Executive Order that covered those of Japanese descent; although it never got to the point of internment, families were forcibly relocated, they were subject to travel restrictions and some had their fishing and other businesses seized if they were located too close to the coast. Probably the most well-known example was the family of Joe DiMaggio. There was also a plan being developed for interning Italian-Americans, but it was realized that with the impending invasion of Italy, America needed the active support of the Italian-American community and that it would be foolish to do something that would antagonize them. Thank you for this reminder. We should all remember this past when we encounter those who want to trade others’ freedom for their safety. There exists a certain level of U.S.citizens’ fear at which they consequently become willing to junk the Constitution. Very true. What is very worrying is when politicians (and even some intellectuals) demonstrate an outright disdain for the Constitution. EphBlog is powered by WordPress and delivered to you in 0.924 seconds using 41 queries..